As is usually the case with popular things in Hollywood, the McConnaisance (as it has become known) is starting to lose attention. The revitalisation of Matthew McConaughey’s career has been thoroughly enjoyable to watch, going from rom-com actor-for-hire to heavyweight Academy Award-winning actor in the span of just a few years. However, more recently he’s been involved in some projects that have had people calling into question his newfound stance as a serious actor, like the poorly-received Gus Van Sant drama Sea of Trees (still without a UK release, but already a major dud after being booed at various film festivals and bombing at the box office) and now the American Civil War drama Free State of Jones. Sure, they may not be very good movies, and in the case of Free State of Jones rather dull and tedious, but is McConaughey really to blame? Personally, I don’t think so, as there are far bigger factors about the film that make it fail where it should succeed. He does decent work as Newton Knight, a Confederate soldier who ditches the battlefield when he becomes disillusioned with the side he’s fighting on. When he’s later joined by fellow deserters, runaway slaves, and all types of Southern outcasts, Knight becomes a spearhead figure in a community-led revolt against the Confederacy, fighting opposition both during and after the war, when there is even more antagonism towards freed slaves than ever before. McConaughey is genuinely good in this movie; he delivers a quiet, humbled and stern performance as a man who increasingly has little left to lose, as do his co-stars including Mahershala Ali as escaped slave Moses, and Gugu Mbatha-Raw as Rachel, a house-slave and later bearer of Knight’s child. All things considered, given what they’ve got to work with, it’s a well-acted movie that shows the strengths of each and every one of its performers, and there’s honestly not a weak performance among the ensemble. It’s just the rest of the film that can’t seem to quite match the obvious talent on-screen. Director-writer Gary Ross doesn’t seem to have any idea what to focus on with this particular historical story, given that there is so much material to work with, so has just decided to cover ALL of it, from its humble beginnings with Knight on the battlefield to the post-war tension, even leading all the way up to an out-of-nowhere wrap-around segment involving his ancestor in the 1940s, who is on trial for marrying a white woman despite being 1/8th black. To try and fit all of this in, even when the overall script would not be altered whatsoever from its removal, Ross has also decided to stretch out the running time to 140 minutes, and because everything is so slow-paced with numerous scenes often going nowhere or seriously needing a trim, it can become so monotonous and dull to watch, even for a Civil War drama. The slow pace and lack of investment and interest in these characters makes the film more of an endurance test rather than a gripping tale of a dark time in American history, like a well-intentioned but ultimately grating movie that a history teacher puts on for his class when they can’t be bothered to teach that day. So no, I don’t think Free State of Jones is a sign of McConaughey finally starting to lose his way after a period of resurgence. Like with most actors, it’s a project that has the best of intentions, but ultimately even they cannot save material that doesn’t translate well onto film, and in this case it’s a rather unfocused script mixed together with some messy direction as it tries to execute a real-life historical story on-screen which probably doesn’t even have much of a dramatic weight to it as a whole. It’s the same with most if not all actors, and just because someone like McConaughey has had a pretty good run as of late doesn’t mean he’s impervious to blips on the radar. Besides, he’s got The Dark Tower and Gold on the way next, as well as voicing a singing koala in Sing (don’t ask), so I highly doubt that Free State of Jones has had any serious effect on the McConaissance whatsoever. Now, let’s all get on with the rest of our lives. 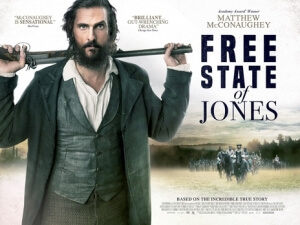 Free State of Jones fails to find the right focus to tell this American Civil War story competently, and not even talented actors like Matthew McConaughey can save the monotonous execution by writer-director Gary Ross.